My very first Mod. 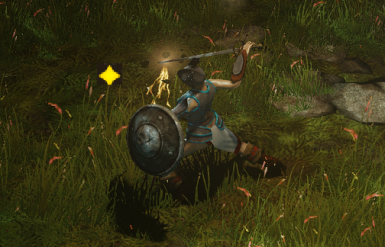 It removes the unpleasant questmarkers on minimap and worldmap which invaded Rivellon with D:OS Enhanced Edition. Maybe there will be an option to disable them in the next patches from Larian Studios. Until this time my Mod will be helpful for all players who don't want to get any type of extrinsic indication of where they should go and what they are going to find. Now it's your decision if to follow a yellow UI-Element, or to take your role seriously! If you like my Mod, please endorse. Meanwhile I have created some other mods for D:OS EE. To find them see below (recommended mods). Extract the zip-folder to the main directory of Divinity Original Sin Enhanced Edition. The four included files will be automatically integrated into Data/Public/Game/GUI. To uninstall just remove the four files 'journal', 'journal_c', 'minimap' and 'minimap_c' from the GUI folder. Compatible with all mods that don't make changes on minimap and journal. You can add and remove my files whenever you want, full save and game compatibility. This is my first mod and I'm not familiar with modding. If the effects on UI are not as expected, please tell me! As far as I can see, everything is fine! UPDATE: 4 endorsements, no bug reports. So you definitely can use it. If you would like to see more changes on UI, write your suggestions into the comment section. I will see what I can do!